Insure multi layer protection. . . Premium 12" wide design fits over most ridge vents. 195% thicker for a superior look! Premium, ultra-high profile look enhances your home. Specially designed for the Western U.S.
Patented Z-fold design... provides the look of thick wood shakes. 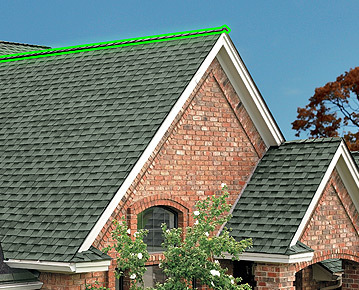 High-quality, cost-effective alternative to using cut-up strip shingles as your ridge cap. Vents your attic while covering your ridge… allows heat and moisture to escape from your attic at the most effective location. GAF Ridge Cap Shingles Are Part Of Our Lifetime Roofing System!